Korea Fact No.15: Koreans Are the Most Widely Dispersed People In the World. A recent study showed that Koreans are the most widespread diaspora in the world as of 2011, the Korea JoongAng Daily reported. Korea had over 7.26 million people settled in 175 countries across the globe, according to the Overseas Korean Foundation. 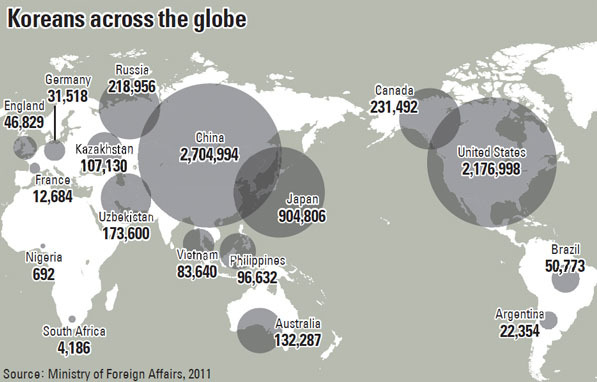 While China had a significantly larger diaspora, 45.4 million people, they were spread across just 130 countries. The release of the study coincided with the 110th anniversary of the first batch of Koreans immigrating to the United States. 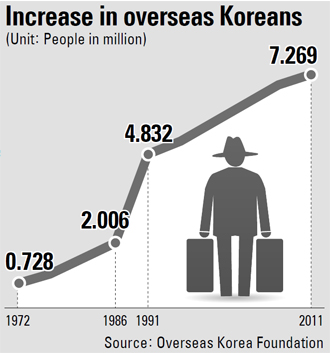 In the past four decades, the number of people emigrating overseas from Korea has increased by almost 10 times. In 1972, only 728,000 people had left Korea to settle in another country, but by 2011 the number jumped to 7.3 million people. China has been the most popular destination for Koreans looking to leave the motherland and the Korean Ministry of Foreign Affairs estimates that 2.7 million Koreans live in China. The second most popular country for Koreans is the United States with 2.18 million people. It has been 150 years since the first group of Korean emigrants crossed into Russia and settled there. The group consisted of 13 farming families from the northernmost border of Korea around Kyonghung County in North Hamgyong Province.